I had never heard of either C. Christopher Smith or John Pattison, the coauthors of “Slow Church,” and I’m guessing you haven’t either. They aren’t Seminary professors or famous church growth gurus. Yet, they are insightful writers with a timely message. As the title suggests, this isn’t a book with a recipe for microwaving your church on the fast track to becoming a mega-church… and that’s quite okay, because Slow Church is not licence for mediocrity either. The book would certainly be useful in a seminary classroom, but I think it’s written by “laymen” so well, every member of the body would be blessed by it. You can look up the table of contents on Amazon or browse through a copy in your local bookstore to see for yourself the breakdown of the book; I’m more interested in sharing with you my impression of the book from my perspective as a Restoration Movement minister. But, I will add here, each chapter stays on track, most of the book is filled with ample quotes from dozens of helpful books, and they conclude their chapters with “Conversation starters” that you could use in a small group study. We are in our 3rd year of a church plant, and most weeks I feel tremendous pressure to be growing our church faster and bigger. I’ve tried to read half a dozen church growth books with titles you’d more than likely recognize, and frankly I couldn’t get through them. I tried to read a few of the “organic” and “simple” church books from the last decade, and I had a hard time plowing through them as well. 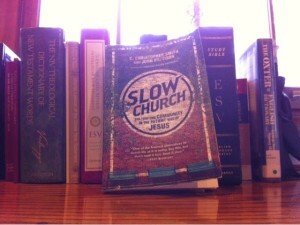 With Slow Church, I had to pace myself, I wanted to savor each morsel. It was so good, I didn’t want to rush through it like a storm that washes away the topsoil, I wanted to let it soak in. As I read Slow Church, I thought of the people I personally minister to, and I wondered how they would respond to the material I was reading. Instead of hawking the book, I mentioned I was reading it, and I did use some of its topics as I preached. I wove in some of Slow Church over a couple of months (in my sermons as I preached & in several tweets on Twitter), and so far I haven’t had to nail the back door shut. Slow Church helped me relax my anxieties and it helped me to refocus my priorities. Slow church isn’t about giving you permission to forget about growth, it helps you to understand what real growth entails. Slow Church defuses the toxic idea that has infiltrated many congregations, namely Slow Church refutes the accepted ideas that efficiency, consumerism, and control are what works best. We are disconnected from our neighbors, our communities, and mostly from the people we worship with Sunday mornings. Slow Church reflects on the need to say no to the hyperactivity and slick ways of the world, and to slow down long enough to experience Christianity the way God intended us to, in community, in peace, and unrushed. Slow Church calls us to reconnect with each other, and to reject the materialistic methodology that drives the fast food industry and most of today’s culture. Slow Church challenges our craving for quantity over quality, and it gives us fresh ways to envision the Kingdom of God — to not just measure success, but to aim for significance. God wants us to partner with Him in His creation, and to expand His Kingdom, and for Slow Church this means we give up our narrow view of staking claim to the pitiful little empires we cling to. And, Slow Church calls us to share life together. We are not in competition with the world around us, and you can’t stockpile manna, so be compassionate and connect with what counts most, people. The heart of Slow Church is about having the right rhythm which brings true Shalom peace, and Slow church reveals our need to be intentional — to realize our identities as disciples of Christ. The industrialized culture of speed that we are immersed in has fragmented and warped us; it’s caused tremendous relationship deficits. Slow Church is a worthwhile read to help us reconnect with the heart of Jesus’ message, to value people, and to see that nickels and noses are not the only or the best marks for faithfulness.